The Pune blasts and the Maoist massacre of the Eastern Frontier Rifles (EFR) Police in Silda, West Bengal, has brought the scarf into sudden prominence. The IGP of the EFR , that bore the brunt of the Maoist attack and lost 24 members, appeared on National television hiding himself with a scarf, and blamed the State government. Earlier, a month ago, without a scarf, he had complained to the district police chief, who it seems didnt hear. While finger pointing has begun, reliable sources indicate that investigations may be handed over to the Black Cats, and this was an effort to show solidarity with them, now that the state government was angry with him for exposing the problems. Turns out that if you have no answer or something to hide, you wear a scarf. Our political correspondent in New Delhi, reports that the Agriculture minister was seen trying on a scarf before the PM's meeting. Post the Pune blasts, the Home Minister was disuaded from wearing white masks matching his lungi. He finally agreed on a colored mask. To be on the safe side, the Railway Minister, also got herself a mask, after someone said she was not doing enough to catch the Maoists blowing up railway tracks in the north east.. This whole concept of wearing masks to hide responsibility was simply turned on its head by the Pune authorities, who immediately banned the women two wheeler drivers from wrapping their faces in masks, something they have been doing for the last 30-40 years. The women wear these in Pune to get protection from the pollution and sun, and are planning to protest the ban. They feel, that wearing scarves to keep something inside from getting out is one thing. Like your mistake, or blame for underperformance. 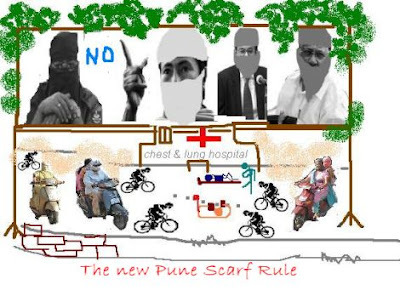 The women in Pune wear scarves to keep the outside dirt from entering in, and as such cannot be classified as a terrorist threat. Smt Shantabai Joshi, a senior citizen two wheeler driver for the last 25 years, has filed an PIL in court, asking for a CBI investigation into, just what constitutes pollution in the air, and does lying, corruption, and cheating from those having lots to hide have something to do with it. The UPA spokesman, when asked about the new scarves, said that there's was a democratic party, and as per tradition, the decision on whether to allow ministers to wear scarves had been left to the High Command. In the meanwhile, its been a week since the Pune blasts, and there are no clues or arrests yet. A lone sweeper, clearing the garbage outside the site, early morning, stopped, rested for a while, after he was racked with a cough. well written. mumbai mirror of 24th feb, wednesday, has an entirely different extract of your this post in its column 'bloggers' park'. 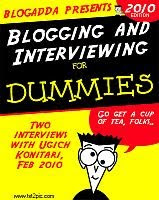 it had prompted me to check out your blog, but i find here that the two dont match. strange ! do check it out if you haven't already. Ankur Thanks for pointing this out. I just checked the mumbai mirror site, and for all 3 entries, they have given what they feel is the gist of each post. Which kind of defeats the purpose of a blog. I have sent them my feedback, and will wait to see if the Old lady of Boribunder deigns to answer. the "ban" has now turned to an "appeal"